The massive expansion of the Washington State Convention Center is embroiled in a legal battle between the center authority and the contractor it terminated in March. A ruling issued Wednesday in King County Superior Court puts the planned $1.4 billion expansion of the Washington State Convention Center (WSCC) in limbo while a legal battle continues. In March, a construction-company partnership that was dropped as the builder filed a lawsuit claiming it was unfairly terminated from the project. 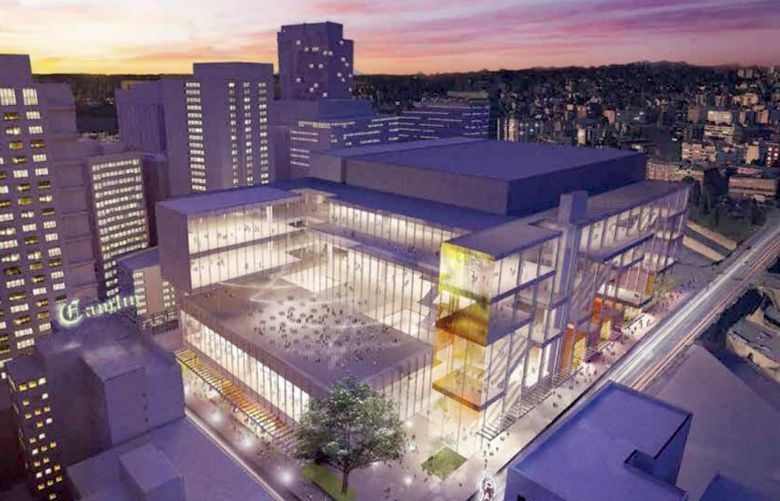 It seeks to stop convention-center officials from finding a new contractor. King County Judge Beth Andrus on Wednesday denied Skanska-Hunt’s bid to be reinstated as the contractor, but granted the request to stop the convention center from starting to select a new contractor. The question of whether the convention-center authority wrongly terminated Skanska-Hunt should be decided in a trial, beginning within 120 days, the judge ruled. Matt Griffin, CEO of the Pine Street Group, which is the expansion’s project manager, said the convention-center team has not made any decisions on how to proceed. Griffin said the project’s architectural design and permitting are moving along, meaning construction could start as planned next year. That is, of course, if the project has a contractor. The Washington State Convention Center Public Facilities District, which controls the convention center, selected Skanska and Hunt Construction last summer to build the expansion, but terminated the contract in early March. The Skanska-Hunt partnership had already spent eight months working on the pre-construction phase of the project, providing services the builder said are worth $4 million. In March, convention-center officials said they planned to choose a new contractor within 30 to 60 days. The ruling Wednesday means they can’t do that. When it chose Skanska-Hunt, the convention center used a process that selected a general contractor based on a variety of qualifications, not simply the lowest bid. Publicly funded projects often use a process in which bids are solicited, and the one with the lowest price wins. According to the judge’s ruling, convention-center officials dumped Skanska-Hunt to replace the team with a cheaper option. The court ruled that the convention-center authority can’t “do over” the selection process simply to find a less expensive firm. Its options are either to bring Skanska-Hunt back onto the project or find a new contractor using a lowest-bid process, Andrus ruled. Pine Street Group said the expansion is projected to generate an additional $240 million per year in economic activity, $17 million in additional tax revenue and 3,900 new jobs. Construction of the expansion is expected to support 6,000 jobs.